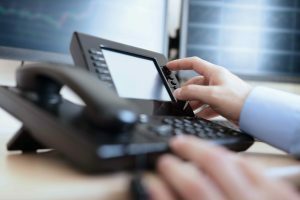 As more and more people are moving to consider VoIP, we decided to discuss another aspect of your telecoms. The phone itself. Some people are used to technology and like to explore hardware, pressing all the buttons and playing with the functions. Others are completely lost, staring at the flashing LED lights like a rabbit staring into headlights. Don’t worry – there is a VoIP phone to suit all levels of IT literacy, budget and requirements. A key point to consider is this – what will you actually need your phone to do? There is a big difference between the needs of a receptionist, and an average user, for instance. The Receptionist will be handling a large volume of calls, will possibly need her hands free, and will almost definitely need a additional phone module to increase her phone display and functionality. Obviously, there is no need for all your users to have this range of equipment. Not all will benefit from a headset, or automatic call answering/ ending module. But some may benefit from some features built in to desk phones. Let’s take this as an opportunity to clarify some points. A VoIP phone is also known as a SIP phone. SIP is the protocol which underpins VoIP phone hardware, and means that all devices from various manufacturers will work together. Things like Call Recording, Call Forwarding and Conference Calling are all part of a Hosted VoIP system, so are not performed by your handset. Functions like this are set up by your VoIP Provider, either as part of your package or as an additional cost. Things like Call Transferring, Busy Light Field (coloured LED on phone indicating whether a colleague is available or on a call) or your personal Phonebook/ Directory are all functions of the handset itself. Your VoIP provider should be able to offer advice or assistance with things like this, but the actual phone itself is where any changes will have to be made. The next thing to bear in mind is configuration. Configuring your phones for end users is an important and often over-looked point. In a multiple user system, typical for any business, call routing and other functions will need to be configured to match the overall business requirements. It is important to bear in mind that, if your VoIP Provider can not provide this function, then you will need to enter these settings yourself. Another over-looked point are updates. As you are probably aware, pretty much all software and devices these days require updating when manufacturers roll out security updates and issue fixes. Bear in mind that, if your Provider isn’t going to perform this for you, then you will have to do this yourself. So – we’ve touched on the phone basics, and some things to bear in mind. The next point to consider is which device will suit your needs best. There are a range of phones and phone types available. If you spend your time having to move from place to place, for instance checking stock or working at different desks, then a DECT phone could suit you best. Just like a ‘walk about’ home phone, a VoIP DECT phone consists of a handset which links wirelessly to a base station. There are no cables to connect you, so you are free to walk, move, stretch, or do anything else you have to. Next on our list are Conference Phones. For those with meeting rooms, or who spend a lot of time on organised conference calls with colleagues, a dedicated Conference phone will be your best option. These phones are fantastic for picking up voices at a distance, making conversations clear and meaning you don’t need to make do with an ordinary phone on the hands free setting. A Deskphone for VoIP will operate as the same as a traditional deskphone. A key pad, handset and connecting cable will be familiar to all, as will the ability to transfer, adjust the volume, and pick up calls for another extension. The next option is a ‘soft phone’. This is an app which runs on your smartphone, tablet or desktop PC. This effectively means that the program has become a virtual device, operating in the same way as a standard phone attached to your larger phone system. You can pick up and transfer calls. Customers calling you get the same experience as they do phoning you on a traditional phone system. Your company Music on Hold, for instance, will play as normal. The customer will experience a phone call to your company, with no indication that you are not in an office. So – as you can see, there are a number of ways to connect to your phone system. You can have a traditional desk phone, a walkabout DECT phone, or a softphone app on your mobile, desktop or tablet! To find out more about your options, just get in touch.